These days Headlight Technology is an important selling point for automakers. There is more to headlights design than its shape that decides how your car will illuminate the road ahead. Headlights have shown a massive evolution from simple acetylene lamps in 1880s to very complex LED assemblies nowadays. 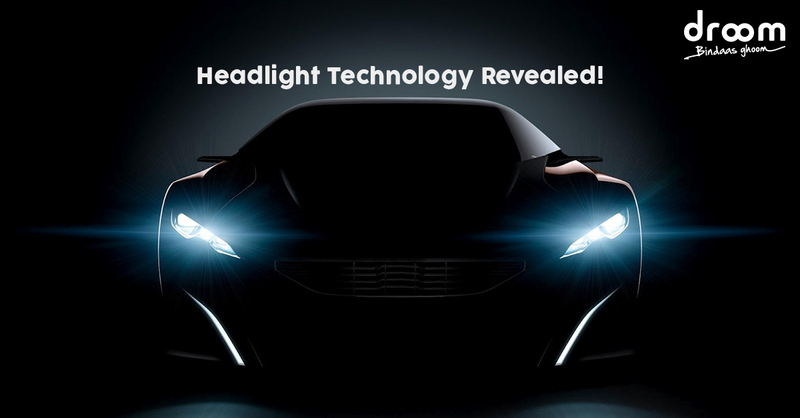 Did you know that Laser Headlights is the new breakthrough in automotive lighting technology. Today we’ll tell you about four Major Headlight configurations of today’s world. It is commonly used in consumer cars.It uses heated tungsten filament to produce light. Primary advantages of these headlights are long lifespan and low replacement cost.The fact that it is less energy efficient and extra care is needed while installation, is slowly shfting manufacturers to new technologies. Also known as High-intensity discharge (HID) lights.It contains a combination of gases and rare metals that are heated to produce blue-white light , three times brighter and produces less heat than Halogen headlights. It first appeared in BMW 7 series in 1991. On some car model HID lights is used for low beam and Halogen light is used for high beam light. Some meodel use bi-xenon light for both low and high beam light.Primary advantage of these lights are longer lifespan than traditional halogen lights, less operating power and more visibility for drivers. It is costlier than halogen lights. It contains small diodes that produces light when electric current excites its electron. The greatest advantage of using these headlights is that they use very less power to operate.the small size of LEDs enables greater flexibility for varied shapes. The major disadvantage is that it produces heat towards bottom of the emitter, which creates a potential risk for nearby parts, connective cables and assemblies. High production cost is another obstacle. Premium car brands like Audi,BMW, Lexus have used this technology in some of its model. Audi continue to pioneer LED technology and have come up with Adaptive LED Technology. A camera is mounted in the windscreen, behind the rearview mirror. Car safety systems read the traffic ahead of you and from the oncoming lane and automatically adjusts the LED beam, to avoid blinding other drivers. This innovation is the next big step forward in automobile industry. BMW i8 and Audi R8 are the first series production vehicles with laser lights.This technology is 1000 times better than LED headlights. This technology promises more energy efficiency,small packaging, better brightness with double range.These lights are very expensive and produces more heat. Laser light is not as focussed LED lights so can only be used for high beams. Only time will tell which technology will become premium headlight technology. What Bentley has in store for its ultra-luxury customer?